Video credit: Mr. Christopher Shea & Family * Thank you from the bottom of our heart. We will always treasure your master piece. Gather the whole family and come to Lebanon Christmas Tree Farm to pick out your very own Christmas Tree. This family owned and operated farm has been in business since 1985. With a large number of shapes, sizes, and varieties you can't go wrong. Take your time picking out your very own Christmas tree as the smell of refreshing fragrances in the air surround you. The whole family can just relax on your jolly adventure of finding the "perfect tree". You and your family can bring your own, or borrow one of our saws to cut down your perfect tree. If your family needs a hand, our family would love to help you out at no extra charge. Let the children enjoy their time running around, visiting our Santa's Kidz Workshop, enjoying a scavenger hunt around the farm, as well as ride the Christmas Barrel Train. The Scavenger hunt for kids/adults of all ages! Post your family pictures on our farm as well as send us feedback or questions on our Facebook! 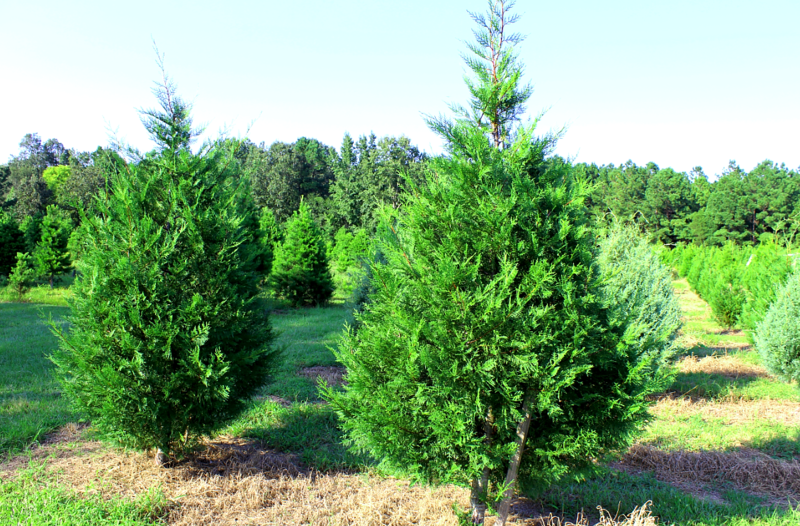 Types of Choose and Cut Christmas Trees: Leyland Cypress, Carolina Sapphire, Spruce Pine, and Virginia Pine. Welcome to Lebanon Christmas Trees Santa's Work Shop For Kids! Upon arriving you will see in the distance a Christmas themed barn set in a winter wonderland setting! In the barn you can purchase tickets for the Christmas train as well as a Kidz Kraft Bag. The train can be purchased separately or packaged up with our Kidz Kraft bags. Each Kraft bag will feature this years craft that the children will be shown how to complete, candy cane, a letter to Santa which they will mail right outside the barn to the North Pole and receive a letter from Santa Clause personally before Christmas, Christmas Coloring book, as well as one Train Ride Ticket! Created just for our older kids/adults, in order to enjoy family time together! Enjoy an exciting Scavenger hunt surrounded by Christmas Trees and fresh air. However don't dally, this is a race against time as families rush to complete this exciting hunt. This is one hunt you do not want to miss out on! "Going out to cut your own Christmas tree might seem old-fashioned in an age of tree lots on every corner and pre-lit trees in a box, but for some families, it's a tradition that lives on." "We've seen people who came (to the tree farm) back in the '80s come back with their own children. It's become a generational thing," says Kim Yerich, owner of Lebanon Christmas Tree Farm, which is just west of Goose Creek."